The Fourteenth Gyalwa Karmapa, Thegchok Dorje was born in the village of Zalmo Gang Danang in the district of Kham in eastern Tibet. He was born in mid-winter, amongst flowers spontaneously blossoming and the appearance of many rainbows in the sky. His father’s name was Gonpo Lhadar, and his mother’s name was Sönam Lhamo. Shortly after his birth, he was heard reciting the Sanskrit alphabet. Drukchen Kunzig Chökyi Nangwa, who had been entrusted with the Thirteenth Karmapa’s prediction letter, found and recognised him. Following this, the Ninth Tai Situpa, Pema Nyinje, enthroned and ordained Thegchok Dorje as the Fourteenth Gyalwa Karmapa. Together with Chökyi Nangwa, he imparted the entire Karma Kamtsang lineage instructions and transmissions to him. Thegchok Dorje lived a very simple life, displaying the behaviour of the ideal monk to all who had the great fortune of meeting him. He banned hunting, saved countless animals from slaughter and demanded the release of innocent prisoners. He was gifted in poetry and dialectics and was a great participator of the Rimé movement. This spiritual exchange took place among great scholars and realised beings, particularly of the Kagyu, Nyingma and Sakya lineages. The Fourteenth Karmapa had transmitted the sacred Kagyu lineage instructions to Jamgon Kongtrul Lodrö Thaye, and both Kongtrul and the Sakya Master Jamyang Khyentse Wangpo possessed rare transmissions which they in turn bestowed upon the Karmapa. 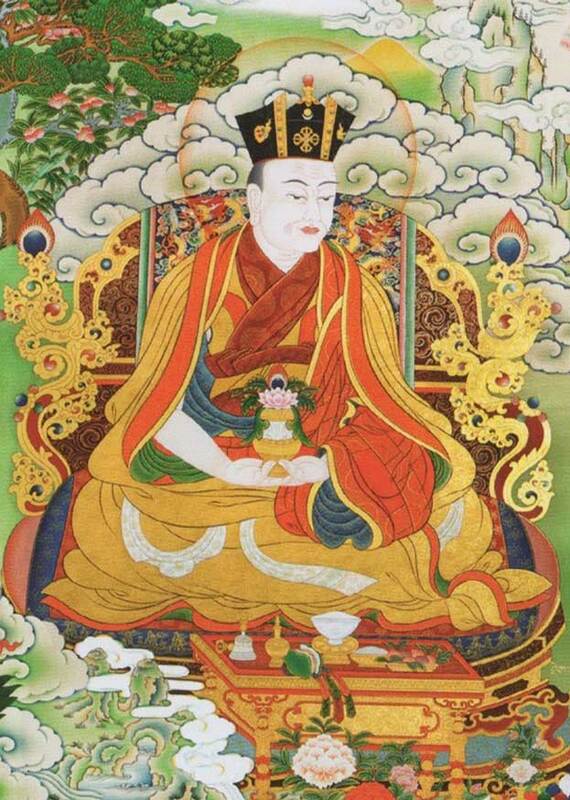 From Tertön Chokgyur Lingpa, the Fourteenth Gyalwa Karmapa received the Dorje Phurba Tantra. This enabled him to introduce the Cham ceremonial dances, which enacted the eight manifestations of Padmasambhava, and to found the Phurba Drubchen during the month of Saga Dawa at Tsurphu Monastery. This is still carried out to remove intense inner and outer obstacles to peace, happiness, and enlightenment. Chokgyur Lingpa also had important visions of future Karmapas, up to the twenty-first, which were recorded in writing and were depicted in a thanka painting. Thegchok Dorje’s main students were Jamgon Kongtrul Lodrö Thaye, Jamyang Khyentse Wangpo, Chokgyur Lingpa, Tashi Öser , Mingyur Wangyal, Tsuglag Pawo Nyinje, Pema Kunzang (the Tenth Tai Situpa, 1854-1885), Nedön Tenpa Rabgye, Sangnag Tendzin, and Lubum Geshe. Having recognised and enthroned the Tenth Tai Situpa with the Red Vajra Crown and later having left detailed instructions about his next incarnation, Thegchok Dorje passed into Parinirvana at the age of seventy-one. The Gyalwa Karmapa’s spiritual heir was his heart-son, Jamgon Kongtrul Lodrö Thaye.